"Thatch" redirects here. For the racehorse, see Thatching (horse). For the aircraft maneuver, see Thach weave. For other uses, see Thatch (disambiguation). Thatching is the craft of building a roof with dry vegetation such as straw, water reed, sedge (Cladium mariscus), rushes, heather, or palm branches, layering the vegetation so as to shed water away from the inner roof. Since the bulk of the vegetation stays dry and is densely packed—trapping air—thatching also functions as insulation. It is a very old roofing method and has been used in both tropical and temperate climates. Thatch is still employed by builders in developing countries, usually with low-cost local vegetation. By contrast, in some developed countries it is the choice of some affluent people who desire a rustic look for their home, would like a more ecologically friendly roof, or who have purchased an originally thatched abode. Palm leaves are also often used. For example, in Na Bure, Fiji, thatchers combine fan palm leave roofs with layered reed walls. Feathered palm leaf roofs are used in Dominica. Alang-alang (Imperata cylindrica) thatched roofs are used in Hawaii and Bali. In Southeast Asia, mangrove nipa palm leaves are used as thatched roof material known as attap dwelling. In Bali, Indonesia, the black fibres of Arenga pinnata called ijuk is also used as thatched roof materials, usually used in Balinese temple roof and meru towers. Sugar cane leaf roofs are used in Kikuyu tribal homes in Kenya. Many indigenous people of the Americas, such as the former Maya civilization, Mesoamerica, the Inca empire, and the Triple Alliance (Aztec), lived in thatched buildings. It is common to spot thatched buildings in rural areas of the Yucatán Peninsula as well as many settlements in other parts of Latin America, which closely resemble the method of construction from distant ancestors. After the collapse of most extant American societies due to diseases introduced by Europeans, wars, enslavement, and genocide, the first Americans encountered by Europeans lived in structures roofed with bark or skin set in panels that could be added or removed for ventilation, heating, and cooling. Evidence of the many complex buildings with fiber-based roofing material was not rediscovered until the early 2000s. French and British settlers built temporary thatched dwellings with local vegetation as soon as they arrived in New France and New England, but covered more permanent houses with wooden shingles. Gradually, thatch became a mark of poverty, and the number of thatched properties gradually declined, as did the number of professional thatchers. 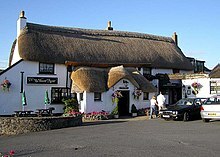 Thatch has become much more popular in the UK over the past 30 years, and is now a symbol of wealth rather than poverty. There are approximately 1,000 full-time thatchers at work in the UK, and thatching is becoming popular again because of the renewed interest in preserving historic buildings and using more sustainable building materials. Although thatch is popular in Germany, The Netherlands, Denmark, parts of France, Sicily, Belgium and Ireland, there are more thatched roofs in the United Kingdom than in any other European country. Good quality straw thatch can last for more than 50 years when applied by a skilled thatcher. Traditionally, a new layer of straw was simply applied over the weathered surface, and this "spar coating" tradition has created accumulations of thatch over 7’ (2.1 m) thick on very old buildings. The straw is bundled into "yelms" before it is taken up to the roof and then is attached using staples, known as "spars", made from twisted hazel sticks. Over 250 roofs in Southern England have base coats of thatch that were applied over 500 years ago, providing direct evidence of the types of materials that were used for thatching in the medieval period. [page needed] Almost all of these roofs are thatched with wheat, rye, or a "maslin" mixture of both. Medieval wheat grew to almost 6 feet (1.8 m) tall in very poor soils and produced durable straw for the roof and grain for baking bread. In the UK it is illegal under the Plant Variety and Seeds Act 1964 (with many amendments) for an individual or organisation to give, trade or sell seed of an older variety of wheat (or any other agricultural crop) to a third party for growing purposes, subject to a significant fine. Because of this legislation, thatchers in the UK can no longer obtain top quality thatching straw grown from traditional, tall-stemmed varieties of wheat. Thatched roof made of ijuk black arenga pinnata fibres, Besakih, Bali. Thatch is not as flammable as many people believe. It burns slowly, "like a closed book," thatchers say. The vast majority of fires are linked to the use of wood burners and faulty chimneys with degraded or poorly installed or maintained flues. Sparks from paper or burned rubbish can ignite dry thatch on the surface around a chimney. Fires can also begin when sparks or flames work their way through a degraded chimney and ignite the surrounding semi-charred thatch. This can be avoided by ensuring that the chimney is in good condition, which may involve stripping thatch immediately surrounding the chimney to the full depth of the stack. This can easily be done without stripping thatch over the entire roof. Insurance premiums on thatched houses are higher than average in part because of the perception that thatched roofs are a fire hazard, but also because a thatch fire can cause extensive smoke damage and a thatched roof is more expensive to replace than a standard tiled or slate roof. Workmen should never use open flame near thatch, and nothing should be burnt that could fly up the chimney and ignite the surface of the thatch. Spark arrestors usually cause more harm than good, as they are easily blocked and reduce air flow. All thatched roofs should have smoke detectors in the roof space. Spray-on fire retardant or pressure impregnated fire retardants can reduce the spread of flame and radiated heat output. The performance of thatch depends on roof shape and design, pitch of roof, position—its geography and topography—the quality of material and the expertise of the thatcher. Thatched houses are harder to insure because of the perceived fire risk, and because thatching is labor-intensive, it is much more expensive to thatch a roof than to cover it with slate or tiles. Birds can damage a roof while they are foraging for grubs, and rodents are attracted by residual grain in straw. Thatch has fallen out of favor in much of the industrialized world not because of fire, but because thatching has become very expensive and alternative 'hard' materials are cheaper—but this situation is slowly changing. There are about 60,000 thatched roofs in the UK, of which 50–80 suffer a serious fire each year, most of these being completely destroyed. The cost to the Fire Brigade is £1.3m per annum. Many more thatched roofs are being built every year. New thatched roofs were forbidden in London in 1212 following a major fire, and existing roofs had to have their surfaces plastered to reduce the risk of fire. The modern Globe Theatre is one of the few thatched buildings in London (others can be found in the suburb of Kingsbury), but the Globe's modern, water reed thatch is purely for decorative purpose and actually lies over a fully waterproofed roof built with modern materials. The Globe Theatre, opened in 1997, was modelled on the Rose, which was destroyed by a fire on a dry June night in 1613 when a burning wad of cloth ejected from a special effects cannon during a performance set light to the surface of the thatch. The original Rose Theatre was actually thatched with cereal straw, a sample of which was recovered by Museum of London archaeologists during the excavation of the site in the 1980s. Some claim thatch cannot cope with regular snowfall but, as with all roofing materials, this depends on the strength of the underlying roof structure and the pitch of the surface. A law passed in 1640 in Massachusetts outlawed the use of thatched roofs in the colony for this reason. Thatch is lighter than most other roofing materials, typically around 7 lb/sq ft (34 kg/m2), so the roof supporting it does not need to be so heavily constructed, but if snow accumulates on a lightly constructed thatched roof, it could collapse. A thatched roof is usually pitched between 45–55 degrees and under normal circumstances this is sufficient to shed snow and water. In areas of extreme snowfall, such as parts of Japan, the pitch is increased further. ^ Thomson, Lex AJ; Englberger, Lois; Guarino, Luigi; Thaman, RR; Elevitch, Craig R (2006). "Pandanus tectorius (Pandanus)". In Elevitch, Craig R (ed.). Species Profiles for Pacific Island Agroforestry (PDF) (1.1 ed.). Hōlualoa, HI: Permanent Agriculture Resources (PAR). Archived (PDF) from the original on 2012-10-21. ^ Peter J. M. Nas (2003). The Indonesian Town Revisited, Volume 1 of Southeast Asian dynamics. LIT Verlag Münster. p. 215. ISBN 9783825860387. Archived from the original on 2017-03-13. ^ "Houses", Fiji, Polynesia, archived from the original on 2009-07-26 . ^ Sedemsky, Matt (Nov 30, 2003), "Low-Tech Building Craze Hits Hawaii; Indigenous Thatched-Roof Hale Once Out of Favor, Now Seen as Status Symbol on the Islands", The Washington Post . ^ a b Letts 2000. 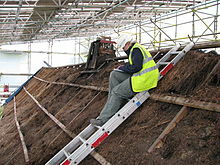 ^ a b Moir, J; Letts, John (1999), "Thatch: Thatching in England 1790–1940", Research Transactions, English Heritage, 5 . ^ "Cotswold Thatched Roofs". Cotswold Life. 20 February 2013. Retrieved 11 December 2018. they are set to increase and some house builders are meeting the demand for new homes with thatched roofs. ^ Letts, John (2008), Survey (unpublished ed.) . ^ "Magical thatched homes that will enchant you". www.msn.com. Archived from the original on 2 April 2018. Retrieved 6 May 2018. ^ Letts, John (2007), Growing Straw for Thatching: a guide, The COHT (Conservation of Historic Thatch Committee . ^ Legislation, 1964, archived from the original on 2012-01-11 . ^ Andrews, Charles Mclean; Andrews, Evangeline Walker, eds. (1981) , Jonathan Dickinson's Journal or, God's Protecting Providence. Being the Narrative of a Journey from Port Royal in Jamaica to Philadelphia between August 23, 1696 to April 1, 1697, Florida Classics Library (reprint ed. ), New Haven: Yale University Press, p. 11 . ^ Thatching from the Bayleaf Palm of Belize, Palomar, archived from the original on June 8, 2007, retrieved June 4, 2007 . ^ Thatch, UK: HCT, archived from the original on 2012-01-11 . ^ The Thatch & Thatching, UK: The East Anglia Master Thatchers Association, archived from the original on 2011-08-31 . ^ "Thatching Advisory Service". Archived from the original on 25 December 2012. Retrieved 10 March 2013. ^ "Florilegium urbanum - Physical fabric - Regulations for building construction and fire safety". users.trytel.com. Archived from the original on 26 October 2017. Retrieved 6 May 2018. ^ Letts, John, Unpublished photos and sample records . ^ "Winter Japan at its Best". Addicted to Travel. Archived from the original on 28 March 2012. Retrieved 7 September 2011. ^ Walker, B, McGregor, C.& Stark, G 1996 Thatches and Thatching Techniques: A guide to conserving Scottish Thatching Traditions. Edinburgh: Historic Scotland Technical Advice Note 4. ^ Holden, T G 2012 Moirlanich Longhouse, Killin: Changing techniques in thatching. Vernacular Building 35, 39-47. ^ Holden, T G and Walker, B 2013 Sunnybrae Cottage, Pitlochry. Edinburgh: Historic Scotland Research report. William, Eurwyn (2010). "Chapter 5: Roofs". The Welsh Cottage. Royal Commission on the Ancient and Historical Monuments of Wales. pp. 145–203. ISBN 978-1-871184-426. The Thatcher's Craft, UK: Battley Brothers Limited, archived from the original on 2015-05-01 . "Thatching in West Europe, from Asturias to Iceland", Research Award, Europa nostra, 2011, archived from the original on 2011-08-15 .